Product prices and availability are accurate as of 2019-04-19 06:53:42 UTC and are subject to change. Any price and availability information displayed on http://www.amazon.com/ at the time of purchase will apply to the purchase of this product. Author Bookstand is proud to offer Pot of Gold by Bookstand Publishing. Bookstand Publishing offers books by the best indie authors throughout North America and the world. Bookstand Publishing is dedicated to offering original content to a broad audience and promoting great authors, literacy, and freedom of expression. 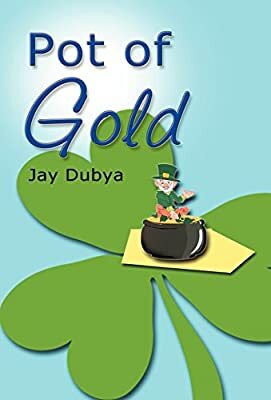 Pot of Gold has generated a lot of interest and excitement and we think it would be an excellent addition to your library. Pot of Gold is an imaginative fantasy adventure story for children ages eight through twelve. Janet and Larry Garrison, twelve-year-old fraternal twins, are touring Limerick Caverns with their parents on St. Patrick's Day. They spot an impish elfrechaun in the caverns and chase him into a strange new land. Four elves have had their gold stolen from their large black kettle, and Janet and Larry must help Rhymer, Prep, Stretch and Nate retrieve their missing fortune. Evilla is a wicked witch who terrorizes the elfrechauns. 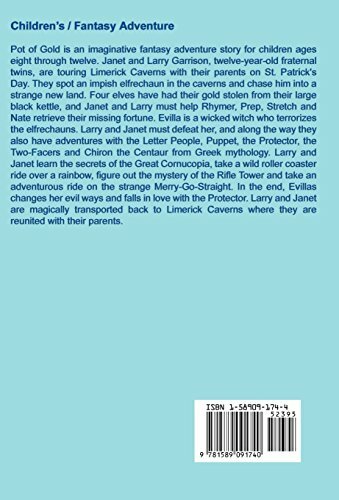 Larry and Janet must defeat her, and along the way they also have adventures with the Letter People, Puppet, the Protector, the Two-Facers and Chiron the Centaur from Greek mythology. Larry and Janet learn the secrets of the Great Cornucopia, take a wild roller coaster ride over a rainbow, figure out the mystery of the Rifle Tower and take an adventurous ride on the strange Merry-Go-Straight. In the end, Evillas changes her evil ways and falls in love with the Protector. Larry and Janet are magically transported back to Limerick Caverns where they are reunited with their parents.